I have been sent 2 to review, and as the whole reusable nappy thing is a big deal for me, I have been busy researching, in my quest to be a genius. So it all began whilst reading pregnancy magazines... I decided I would use reusable nappies, and this is a big deal as I am far from a green goddess. They were sent to us by BabyKind. Anyway, they need to be washed before use and I have not done so yet, but before the week is out, Aaron's bum will meet my genus and we'll have a review by the weekend, and before Monday. That's my goal. I bought Lollipop nappies before JC was born and initially I loved them (despite all the washing) but the problem was that they became too tight for him very quickly. He is a big lad and he had really bad colic so I actually had to stop using them at 3 months. Such a waste of money and I was gutted as I'm quite environmentally aware. 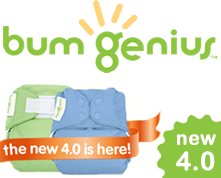 I'm looking forward to see what you think of Bum Genius as I might considering getting a bigger size at the Babyshow in April.